Buy a copy for each of your board members, today. Do you want a better board? We help your board learn better practices while adapting our work to the unique needs and culture of your organization. Because there is more than one way to excellence in governance. Your board benefits from our expertise, grounded in research and experience. We’re not here to beat up your board members. Instead, we want to inspire them to reach high, to be all that they can be to make your organization strong and your vision real. We also work with staff leadership to be a more effective partner with the board. We’d love to work with you and your board. Get your board started on the path to improvement today! 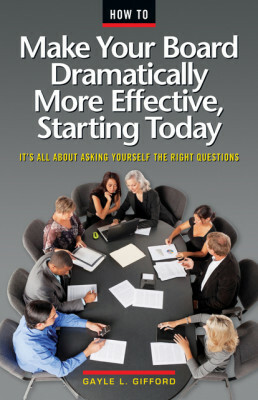 Gayle’s book, How to Make Your Board Dramatically More Effective, Starting Today, is an easy to read and inspiring guide for your board. Order a copy for each of your board members, today. Gayle is a member of the Governance Affinity Group of the Alliance for Nonprofit Management and a member of the research team that developed the groundbreaking study: Voices of Board Chairs. Gayle is a contributor to You and Your Nonprofit Board: advice and practical tips from the Field’s top practitioners, researchers and provocateurs.